Hurricane Harvey recovery efforts have brought on some unity among Americans, but how can we keep it going after the relief? Hurricane Harvey has devastated the state of Texas in a way unheard of since Hurricane Katrina in 2005. 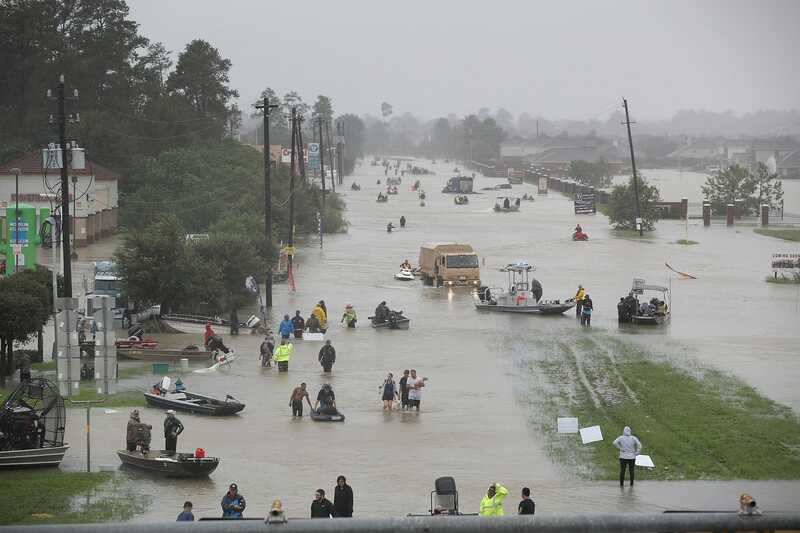 Thousands have been displaced, thousands have died or been injured in the storm, roads are under fifteen or more feet of water. Despite the damage, of course the people in the government and some alt-right supporters are pointing fingers, trying to find the blame for the destruction. Obama wasn't president during Katrina, Trump donating a million dollars means nothing. This is not the time to be trying to throw someone else under the bus or say “well if they had just done this” to find the ones responsible. Rather, we must become completely unified to help the people affected by the storm get their lives back to normal. Look at the groups that are accepting donations and helping – especially those that started within moments of the first reports. The Red Cross is active and aiding in everything they can, while at the same time twenty-one Houston area mosques are acting as shelters. Meanwhile, Joel Osteen's megachurch has to be called out on being hypocritical and selfish for not allowing anybody in – and no, the building wasn't flooded, a nearby parking garage was. Unity will not be found if Osteen refuses to allow starving, homeless families into his multi-million dollar excuse for getting a tax exemption. Rather, the mosques and the churches and the synagogues must all accept anybody who is displaced, and work together to help separated families reunite. Charities are in danger of doing the same thing, being that they can easily fall to trying to one-up the “competiton”, only to further risk lives and cause more problems for innocent people. It doesn't matter how many people they help, what matters is if they can keep those people safe from the storm. Every single group down there must put aside the behind the scenes competition and focus on the real situation they have vowed to help victims through. On that same note, people from all walks of life have stepped in to help. Natural citizens, immigrants, tourists, practically everybody in the area who is able to has jumped in to join the rescue parties, serving food at shelters, helping people find each other, anything they can do. This here is true American behavior. All races, religions, creeds, and backgrounds coming together in the name of helping their fellow man. No matter what people in the leadership say, nobody is any better than another because of who they are. The amount of money you donate means nothing, but whether you actually mean it or you're just doing it to look good. Going and volunteering to serve food to those in need can mean just as much as transferring a fraction of your fortune. For example, in the months after 9/11, voice actor Kevin Conroy decided to instead of donating some money he'd just make back later on, he went to help cook for the rescue and emergency teams at the site. And in Hurricane Harvey, many are doing just that. Regular people jumping into the water to save somebody's life, or checking people into a shelter – that is showing true patriotism. If we want to help people, especially in times of crisis like this, we cannot let ourselves be petty and find someone to blame or just assume a couple of bucks is good enough to be considered a “charitable” person. We must come together and aid our fellow human beings, however we can. Obviously we can't all be down in Houston helping people out of the water or to a shelter, but we can at least stand together and work to making the country strong enough to support those who have lost everything. Patriotism isn't just waving a flag around and buying those yellow ribbon magnets for your car, it's also stepping up to help out your neighbor when they need it most. That's real unity, and if we can just get a little more of that, we might just end up being better off.